The Coal River watershed is located in the heart of the historic southern West Virginia coal mining region. The Big Coal River begins near Whitesville, WV. Route 3 borders the Big Coal River from Peytona to Whitesville. Boone County's John Slack Park is located in Racine and offers public boat access, picnic shelters, and has a public swimming pool. Visit Drawdy Falls at Peytona and imagine 100-foot long riverboats pushing coal barges through the locks near Peytona Bridge in 1855. Sylvester, Comfort, and Orgas are also located along this stretch of WV Rte. 3. The Little Coal River begins near Madison, the home of the historic Boone County Courthouse and the Boone County Coal Museum. Follow WV Rte. 85 through Danville to the junction of US Rte 119 (Corridor G). 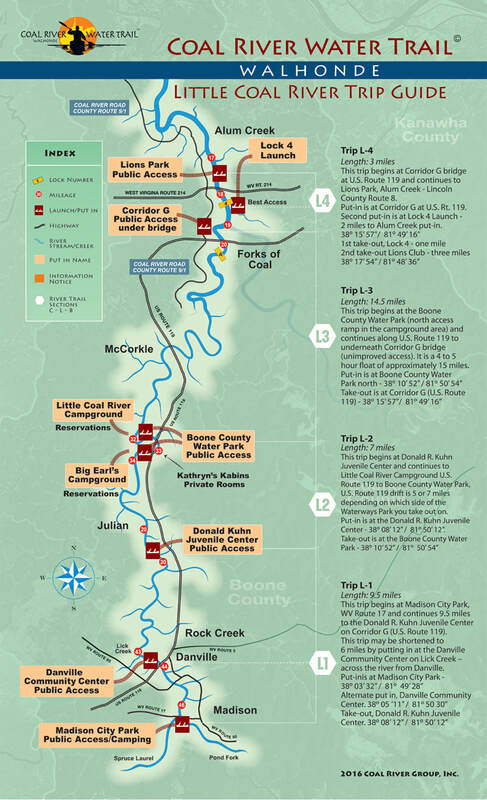 The river flows north along the Corridor and passes the Boone County Water Park, the trailhead for the Hatfield-McCoy ATV Center, and joins the Big Coal RIver at Alum Creek. 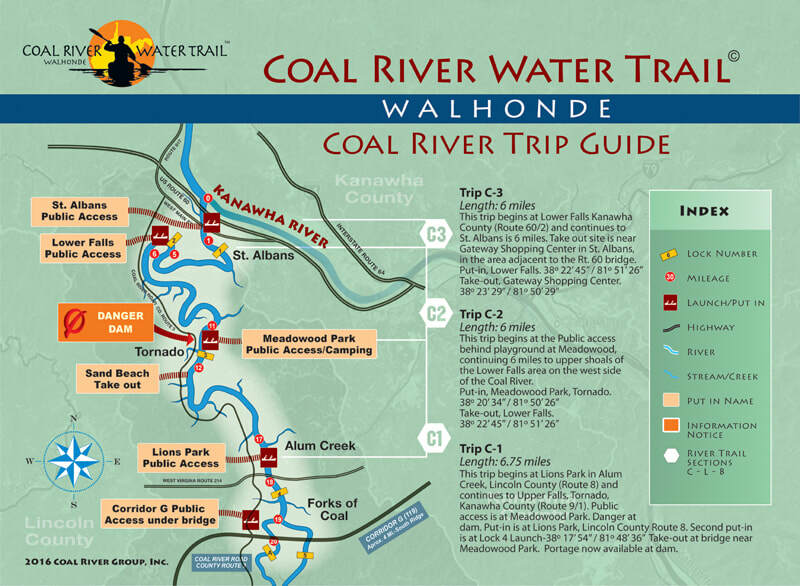 The Little and Big Coal Rivers create the Coal River, which extends from Alum Creek to the Kanawha River at St. Albans. Along the way, Rte 3 runs parallel to the river and passes four sites of the historic locks and dams. The community of Tornado provides offers views of the picturesque Upper Falls dam, Meadowood Park, and Big Bend Bend Golf Course. Lower Falls, located on Strawberry Rd in St. Albans, in another lock and dam site. St. Albans is the largest town in the Coal River watershed. Located on the Midland Trail (US Rte 60), the historic town offers visitors a host of restaurants, museums, and river-based recreation opportunities. The community's annual YAK FEST offers participants in the Annual Tour De Coal river float, two days of big name entertainment, craft beer, food for all and a wild assortment of river, kayak and fishing exhibitors.......It's a HOOT! Click Here For Kayaking Info. Click Here For Fishing Info. Click Here For Launch Sites Info.